Construction Accidents: The Willow Island Disaster | Marc Meadows, P.E. Experience has taught us that preventable construction accidents often have more than one cause. It was certainly true for the Willow Island disaster, where several negligent safety violations snowballed into one of the biggest construction accidents in U.S. history. Due to rapid population and industrial growth in the U.S., the 1970s saw the construction of many new coal power plants. The Allegheny Power System was adding a new plant with two large cooling towers in Willow Island, West Virginia, to expand production. Cooling towers are the large, concrete, hyperboloid structures that most people associate with nuclear plants, but they are also used with coal plants. They simply eliminate waste heat through the cooling of a water stream. You don’t just see them at power plants; you probably have something similar connected to the HVAC system in your home. Have you ever thought about how a giant concrete tower might be built? There are a few strategies, but the Willow Island towers were being built with a technique that is similar to coil pottery. Five-foot layers of concrete were added on top each day using a jump-form system. Concrete is poured into the form, adding a new layer to the structure. After it dries, the form is bolted into this new layer and lifted to pour the next one. Up and up it goes, until the tower is complete. So that’s how the concrete is poured; what about the construction workers? They need a place to work. Just like the jump form, the scaffolding is bolted into the concrete as the layers are built, wrapping around the structure like the threads of a screw. By April 27, 1978, the first tower at Willow Island was done, and the second tower had reached a height of 166 feet. The scaffolding and jump form had been raised, and the construction crew was in the middle of pouring the next level when disaster struck. The cable hoisting the large bucket of concrete suddenly went slack. The crane making that lift fell toward the inside of the tower. The previous day’s concrete, not yet completely cured, began to collapse. All around, the concrete peeled off the top of the tower, taking the forms and scaffolding with it. 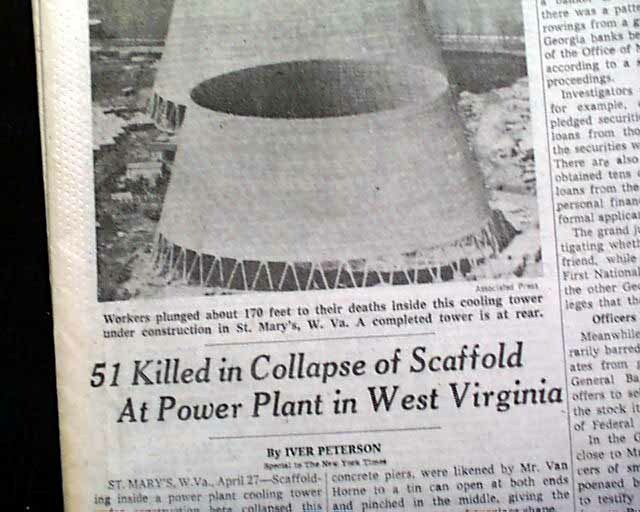 The 51 construction workers that were on the scaffold all fell to their deaths. As I mentioned in the beginning of this article, construction accidents often have more than one cause. Most engineers like safety to be redundant—one thing going wrong shouldn’t end in disaster. The Willow Island disaster had several causes, mostly preventable. The concrete hadn’t cured. Curing can take time—sometimes up to four weeks before the concrete reaches full compressive strength. The fastest concretes can cure in as little as 24 hours, but that can change based on weather conditions. The ambient temperature was near freezing overnight, slowing the curing process, so the concrete was much weaker than it would have been under ideal conditions. The scaffolding wasn’t secured properly. After the accident, it was found that many bolts meant to attach the scaffolding to the tower were missing. The bolts they did use were of insufficient strength for the job. The hoisting system was modified without consulting an engineer. The crane, jump form, and scaffolding system were all designed for certain geometry. The crane had to be located at the correct spot at the top, and each bucket of concrete hoisted from a certain spot, for the system to have proper strength. The crew was cutting corners by loading concrete from different spots, resulting in angles that weakened the system. When the hoist failed, it was the match that lit the fire. The construction team was rushing. Time is money! Every cause above was a result of pressure to build the tower as fast as possible. When workers are pressed to move quickly, safety precautions are often overlooked. Safety is a cultural issue. Whether we are talking about our country or just an individual construction crew, culture determines the value we place on the environment, human life, and profits. Penalties aren’t severe enough. After OSHA discovered 20 willful or serious safety violations, the company responsible for the Willow Island disaster settled for a meager $85,500 for the deaths of 51 construction workers. The decision makers aren’t held responsible. Despite willful violations that resulted in dozens of deaths, and against OSHA’s recommendation, the Department of Justice didn’t file charges. Complacency is rampant. When the company culture promotes speed over safety, workers learn that they must cut corners if they want to keep their jobs. Over two years of construction, there had been three other accidental deaths on the job site, as well as two fires. Construction accidents happen when saving money is valued more than protecting life. Unfortunately, the victims are often the ones pressured into making these compromises in the first place, whereas the perpetrators walk away with their profits.